Listeria monocytogenes bacteria don't play fair. Healthy people can usually handle the food-borne infection, but the bacterial infection hits pregnant women, fetuses and cancer patients very hard. 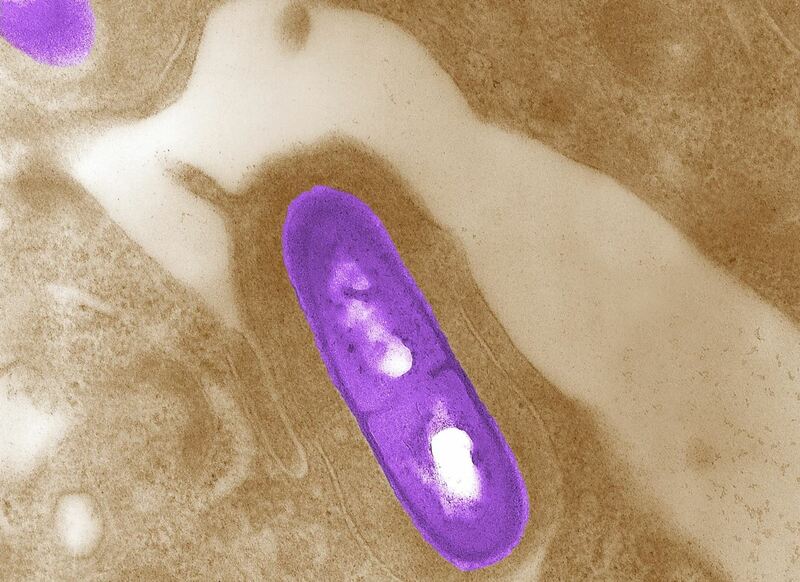 Interestingly, a new study found that other bacteria may help prevent Listeria infections in those people. Researchers from Memorial Sloan-Kettering Cancer Center in New York have identified four species of gut bacteria that worked together to inhibit the growth of Listeria monocytogenes bacteria in laboratory cultures and when given to mice as a probiotic mixture, they limited the bacteria's ability to thrive in their gut. The study, led by Simone Becattini, Ph.D. and Eric G. Pamer, MD was published June 6 in The Journal of Experimental Medicine. Listeria is found in soil, water, and some animals, like poultry and cattle, and can be present in raw milk and in foods made from raw milk, such as cheese. People become infected with the bacteria by eating food or milk contaminated with the bacteria. Don't Miss: Pasteurization Has Saved Millions of Lives, So Why Do People Want to Drink Raw Milk? Keeping food contaminated with Listeria cold doesn't prevent the bacteria from growing — in fact, the bacteria can multiply in the refrigerator and contaminate other food and surfaces there. Cooking and the process of pasteurization, a heat treatment that destroys disease-causing microorganisms in foods and beverages, are the only way to kill Listeria in foods. In most healthy people, listeriosis — infection with Listeria monocytogenes — might mean fever, watery diarrhea, nausea, headache, and joint and muscle pain that eventually resolves on its own or with the help of antibiotics. But, in pregnant women, people with chronic diseases, and cancer patients it's a different story. Expectant mothers are 10 times more likely than other healthy people to contract an infection with Listeria. That risk rises in pregnant Hispanic women — they are 24 times more likely than other people to become infected with Listeria. Pregnant women who develop listeriosis can experience miscarriage, stillbirth, and serious illness or death in their newborn babies. Cancer patients can have up to a 1000 fold increased risk of contracting listeriosis, depending on the type of cancer. Everything from cantaloupe to bean sprouts to pre-packaged caramel apples has caused Listeria outbreaks in the US. Listeria sickens about 1,600 people each year, and about 260 die after the bacteria penetrates the gut lining and enters the bloodstream to cause an infection throughout the body. Trying to prevent listeriosis in high-risk populations is the best way pregnant women and people with chronic illnesses can avoid the infection. But, even if people at risk avoid all deli meat, cheese, meat spreads, smoked seafood, and raw milk that is no guarantee that the bacteria doesn't hitch a ride on fruit (or, really, anything) that came into contact with contaminated water, soil, or other food. Building a stronger defense in people vulnerable to infections with Listeria may be achievable, according to the new research by Becattini and his team. The study showed that when mice had a diverse population of bacteria in their gut, Listeria monocytogenes administered to the mice was not able to multiply or move out of the gut into the bloodstream to cause a systemic infection or death. Treating the mice with streptomycin, an antibiotic that killed off the diverse types of gut bacteria resulted in fatal infections in 50% of the mice within six days. When the scientists treated mice with doxorubicin and cyclophosphamide, two commonly used chemotherapy drugs before giving them antibiotics, a small dose of Listeria monocytogenes generated infections that were fatal to all mice. The study team found four species of gut bacteria, members of the Clostridiales order, worked together to inhibit Listeria monocytogenes growth in laboratory cultures. When these bacteria were given to mice with impaired immune systems — similar to people with cancer or other chronic diseases — as a probiotic cocktail, Listeria was not able to multiply in the gastrointestinal tract and move out of the gut into other tissues and blood. Our results also raise the possibility that in other at-risk categories for listeriosis, such as infants or pregnant women, disruptions to the gut microbiome could be a contributing factor to susceptibility. Pregnant women in their third trimester, the phase in which susceptibility to Listeria is known to be highest, show an altered microbiome, with a marked reduction in Clostridiales species. Becattini and co-authors suggest that we may be able to prevent human Listeria infections by establishing and retaining populations of healthy gut microorganisms in patients where it has been disturbed, similar to the Clostridiales cocktail given to the mice. Preventing the bacteria from taking hold as an infection might be much easier and much more efficient than making every susceptible person guess — and then avoid — foods that might harbor Listeria. Maybe one day, every pregnant woman will be able to eat deli meat to her hearts' content.